Finding Keywords Doesn’t Have to be Tough! Most people tend to do their keyword research completely wrong, not because they are bad people, simply because they have been lead astray over the years by all of the “sound bites” of misinformation out there. As a website owner, it is imperative to your search engine success to understand how to find keywords for a website, but this all starts with understanding how to research keywords. Well, maybe not fall completely in love, but I am a simple man so I am going to keep the process of keyword research very simple for you, but only if you take action on what I teach you. II am going to show you the THREE things I make sure of when doing keyword research. Yes, only three and these are the only three things that you need to watch for when doing keyword research for your website. (1) Low COMPETITION. This is my first focus when doing keyword research. If a keyword has too much competition, I don’t even consider it. The reason for this is that without being able to rank (and do so efficiently), I know that I am not going to be getting any traffic. So no rankings = No point! When I look for competition, I look for a specific metric call QSR (known as Quote Search Results). There is only one tool that I am aware of that offers this piece of data in an efficient way, and that is Jaaxy. And yes, that is the tool I use for my keyword research. QSR allows you to determine the EXACT number of competing pages in Google….which is your REAL competition. I am for a QSR of under 300 (that is, 300 competing pages in Google), the closer to ZERO the better. (2) Must get some TRAFFIC. I don’t go for “homerun” keywords, I will settle for bunt singles all day if I can get ranked. There is absolutely no sense in “trying” to get rankings under a high volume, but high competition keyword. I won’t get ranked, so who gives a rats how much traffic it could potentially get. I go for the sure thing. If a search term gets over 50 searches per month, I go for it. Yes, 50. But Kyle, that seems really low? Yes, it is quite low but guess what. 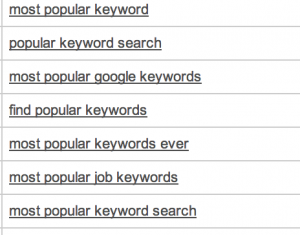 These low volume keywords add up when you start ranking them. Get 1st page rankings in the search engines under 10, or 20….0r 100 of these and you are going to . AND, the lower competition, moderate traffic keywords are typically more relevant and convert better anyways. Another added bonus. If I tried to make use of the first keyword, I would have a tough time. It simply does not make sense. So as a rule of thumb, if I feel like I am forcing awkward content to target a keyword, I simply will not use it. It must make sense to people because remember, we are writing content for our audience, not search engines. Third Keyword Pillar: Must make sense to a human being! Take a topic or theme from your website and plug it into the search tool below. Follow through my THREE search principles and you will be uber successful going forward. I can assure you of that. If you have any questions about keyword research or how to find quality keywords to use on your website, just ask. I have 10 years of experience with this stuff and I will be more than happy to help you out. As a Jaaxy member, can I get your take on Jaaxy compared to Long Tail Pro? I see LTP is being suggested as a great tool for locating powerful buyer keywords that will rank in Google and it has been suggested that Jaaxy is ‘more effective for building authority websites rather than targeting specific keywords that will rank’ (quote). I thought about that statement and it did not make sense to me. It would seem both tools are good and both can achieve the same results, but there are one or two fundamental differences. Some differences I have noted: I understand that Jaaxy gathers its keyword data results from multiple sources whereas LTP extracts its keywards off Google Keyword Planner only. The KC function in LTP is promoted as the effective part of the package for determining the best keywords to get fast ranking. It works on a 0 to 100 scoring where lower numbers are best using it’s own algorithm to give an ease of ranking score. The SEO function on Jaaxy would seem to do exactly the same thing on the same number scale (but in reverse where higher is better). With LTP extracting its keywords results off Google Keyword Planner only, it would seem to me that the SEO function on Jaaxy will achieve a better result if other search engine data is being taken into account with Jaaxy’s system. It seems to me that Jaaxy would be the better with a spread of source data where as LTP only takes Google into account. Be interested to hear your comments. The problem is the fact that keyword tools like Long Tail Pro rely on data that is freely accessible within anyone Adwords account…in fact you have to be logged into access it. That is not a keyword tool, that is nothing more than a hack. This data is free and readily available and if you want to access this sort of data, you can. Simply go there and set up a free account. The other problem here is that Google data alone is highly inaccurate. Search volumes are usually overinflated or totally deflated, thus providing you with a skewed view and setting up you most of the time for false expectations. They also don’t provide you with accurate competition data, the most important metric when you are determining which keywords are good for SEO. Jaaxy takes data from ALL search engines and runs it through their data normalized algorithm to produce the most accurate traffic data. All data is just an estimate at the end of the day as there are many fluctuations throughout the year in any search activity, but the keyword data you can rest assured is very reliable within Jaaxy. As for keyword competition, if you don’t have this important piece of data you don’t stand a hope in knowing which keywords you can quite easily rank for and which ones you don’t stand a chance for. The QSR metric within Jaaxy will tell you exactly how many pages in all of Google (and search engines for that matter) that you are competing with. This is a keyword researches dream metric. Hey Kyle…Nice…Question…with the recent changes that Goggle is making with the algorithms…are you lowering the QSR to under 300 for the sweet spot? Yeah, the sweet spot has been lowered to under 300 since the recent Google Penguin updates. I will update the content to reflect that, thanks for bringing that to my attention Ronny. As always, the closer the QSR is to ZERO, the better. Hi Kyle, I loved this it really did answer a few questions that I had. I do have another question though, how much traffic should a keyword get to be considered enough? I have a keyword that has 128 monthly searches, 22 traffic, and a QSR of 245, and a SEO power of 87. It is the “monthly searches” component that you are looking at. The traffic is an estimate if you get ranked, so you can disregard that when coming up with keywords to choose for your SEO campaigns. Over 5 monthly traffic is just fine. I typically narrow things down by the QSR first, look at traffic second, and then of course make sure they keyword makes sense before using it.